A garden hose must be strong and durable to withstand both internal and external adversities - high water pressure and solar degradation. Rubber hoses are good on both these counts but they are also very heavy and somewhat prone to kink and tangle. Vinyl and nylon are much lighter. Modern hoses have several layers (plies) of different materials. These extra layers make the hosepipe very strong. The smooth inner layer of the hose facilitates water flow. A vinyl-rubber layer gives the hose kink-resistence. A nylon-mesh layer of fabric gives the hose longditudinal strength and resists thorns. An ultra-violet light resistent outer layer protects the hose from sunlight damage. For most water pressures, a 5/8 inch diameter hosepipe will be most efficient. Larger diameter and higher-pressure hoses allow a given area to be watered in less time. To increase the longevity of your hose, do not leave it out in the sun. Whatever your hosepipe is made of, over time the strain of heating and cooling will lead to cracks in the hose. Your hose will be less prone to kink if you care for it well. 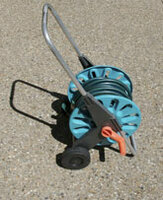 Using a hose reel will help prerserve the smooth coils created when the hose was manufactured. There are a number of accessories on the market to control the flow of water from the hose. Nozzles attach to the end of the hose to atomize the flow of water into a spray. Some nozzles produce a powerful jet spray and others a delicate mist suitable for watering tender, fragile plants. Whereas nozzles propel water, water breakers drop water. Using a hose with a water breaker is similar to using a watering can with a rose. It is also worth buying high-quality hose fittings. Brass fittings are the most reliable but high-density plastic from a recognized manufacturer is also good. The best quality hoses are 5-ply and have brass fittings with an integrated washer.